Twin Star Exorcists is a new supernatural action manga series from creator Yoshiaki Sukeno. VIZ Media is publishing the series in English under its “Shonen Jump” imprint. 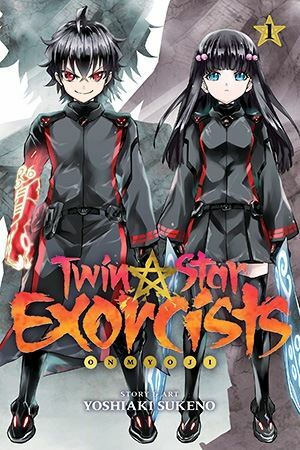 The series is currently ongoing in Japan, and VIZ will release Twin Star Exorcists English-language graphic novels twice a year, both in print and in digital editions. The series focuses on a pair of mystical warriors with intertwined destinies. Rokuro Enmado wants to be anything but an exorcist. Then, he meets a mysterious girl named Benio Adashino, a 14-year-old who is serious about being an exorcist. Twin Star Exorcists, Vol. 1 (Entitled Exorcisms; Chapters 1 to 3) opens with an exorcism. We learn that an evil realm known as “Magano,” is a place where monsters called “Kegare” dwell. The Kegare come to this world to kill and to kidnap humans, so exorcists must purify them. THE LOWDOWN: The Twin Star Exorcists manga is like most action-fantasy manga published under the “Shonen Jump” and “Shonen Jump Advanced” imprints. It is filled with a complex back story and an internal mythology riddled with terminology, techniques, processes, etc., that is all built around the supernatural. But it is a good read. Twin Star Exorcists Volume 1 is hugely engaging. I think readers will be drawn into its world. The monsters are awesome and scary, and the stakes for the heroes are high and definitely involve life and death. Rokuro and Benio's predicament is funny, and is along the lines of that found in the manga, Nisekoi: False Love. Like Nisekoi, Twin Star Exorcists is funny and edgy, and sometimes the comedy is quite edgy. Right now, I find the supporting characters to be soft and not well-developed. Of course, I'm a sucker for the battles, fights, and explosive magic, so I think Twin Star Exorcists has potential. POSSIBLE AUDIENCE: Fans of action-fantasy, shonen manga will want to try Twin Star Exorcists.